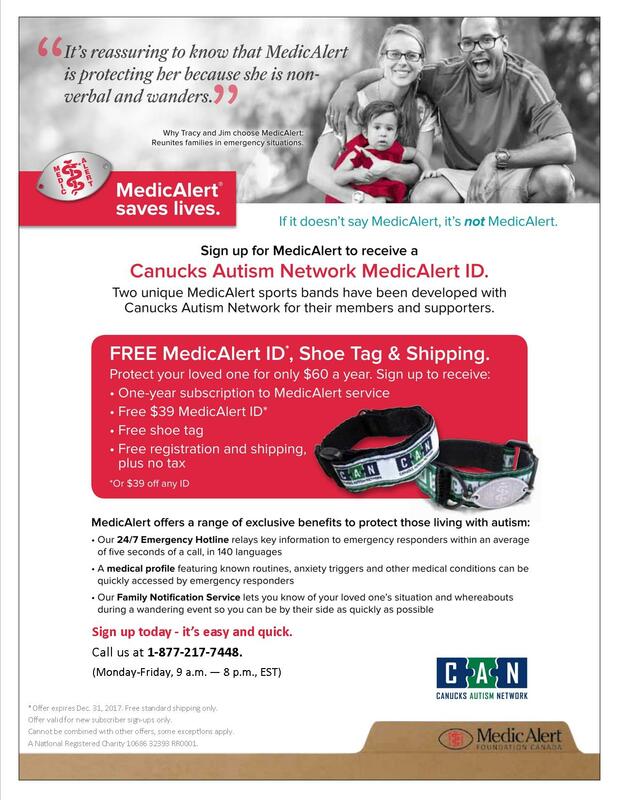 UPDATE: In celebration of CAN’s 10th birthday, MedicAlert is offering new subscribers 1) a FREE one-year subscription and 2) a Canucks Autism Network ID bracelet and shoe tag for $50. This special package is valid until Tuesday, July 31. Call MedicAlert at 1-877-217-7448 (Mon-Fri, 6am-5pm PST) to sign up today! Statistics show that approximately 49% of children with autism wander or elope from their parent, guardian or from a safe environment.¹ Individuals with autism can also be hesitant or anxious when interacting with those they are unfamiliar with. This can present a significant challenge for first responders and healthcare providers to deliver necessary care and attention in emergency situations. That is why the Canucks Autism Network (CAN) is so excited to announce that we have collaborated with MedicAlert to increase the safety of individuals with autism nationwide. MedicAlert is Canada’s leading provider of emergency medical information services. Subscribers of their service are given a unique identification number engraved on their MedicAlert ID which directly links first responders and healthcare providers to their photo, identity and vital medical information. For individuals with autism, their medical profile can include known routines, anxiety triggers and other conditions that may be relevant in an emergency situation. Beginning today, MedicAlert is offering two unique CAN-branded ID sports bands as part of a special subscription package. With the purchase of a $60 one-year subscription to MedicAlert’s service, subscribers will also receive the CAN-branded sports band (available in both white and green), a shoe tag, registration and shipping free of charge. To sign up for MedicAlert’s special Canucks Autism Network offer, please call MedicAlert at 1-877-217-7448 from Monday-Friday, 9am-8pm EST (6am-5pm PST). For families who may already be MedicAlert subscribers or who are interested in purchasing an additional sports band, the cost of a second sports band is eligible for reimbursement through autism funding in British Columbia. In 2016, Ryan also led the charge in providing autism training to over 500 first responders province-wide. With this new MedicAlert initiative, CAN’s autism training will now include details on the program so that first responders will know to quickly identify individuals with autism through the CAN-branded bracelets. Together with MedicAlert and the first responder community, we are so thrilled to be increasing safety for individuals with autism and peace of mind for their families.